Rahul Sharma, MD, MBA, CPE, FACEP, is chairman of the New York-Presbyterian/Weill Cornell Medicine’s newly expanded and comprehensive emergency medicine department. An AAPL member since 2011, Sharma has served as physician-in-chief at NYP’s Lisa Perry Emergency Center since 2016, expanding the division’s research and education initiatives while ensuring quality emergency department patient care. As the department’s new chair, he is tasked with enhancing these initiatives by recruiting accomplished physicians and scientists while driving innovations in telemedicine and initiating fellowship programs to “nurture the next generation of health care leaders.” Sharma also becomes chief and medical director of NYP’s emergency medical services enterprise. Jonathan B. Jaffery, MD, MS, MMM, FACP, who serves on AAPL’s advisory panel, was appointed by the Government Accountability Office to a three-year term on the six-member Medicare Payment Advisory Commission. A professor of medicine at the University of Wisconsin’s School of Medicine and Public Health, he also is senior vice president and chief population health officer at UW Health and president and CEO at UW Health ACO, where he is responsible for the development, coordination and implementation of population health management strategy. MedPAC advises Congress on streamlining and administering Medicare payments and programs. Jaffery has been an AAPL member since 2008. Ronald Reynoso Hernandez, MD, CI, MMM, CPE, CEP, FACP, FHM, is the new chief medical officer for Adventist Health Bakersfield and Adventist Tehachapi Valley in California, where he will serve as the administrative liaison between hospital administration, the governing board, the medical staff and outside agencies. With 16 years of clinical and administrative experience, his responsibilities also include patient care quality at both facilities. He has been an AAPL member since 2012. Anthony Slonim, MD, DrPH, CPE, FAAPL, president and CEO of Renown Health in Reno, Nevada, and his organization are expanding access to prevention and intervention services for mental health disorders and alcohol and drug addiction. Renown, a not-for-profit network, is receiving a $6 million donation over the next five years from Reno philanthropist Stacie Mathewson and her husband to build the Stacie Mathewson Behavioral Health and Addiction Institute. Mathewson's son died of an overdose five years ago, at age 29. 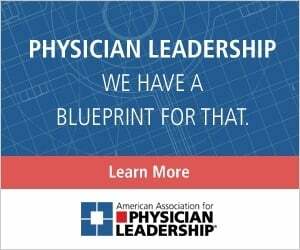 Slonim, who also is editor-in-chief of the Physician Leadership Journal, has been an AAPL member since 2002. Attention, association members. Were you recently promoted or receive an award? Got a new job? Publish a book? Or achieve some other milestone? Share your news with colleagues through Members on the Move. 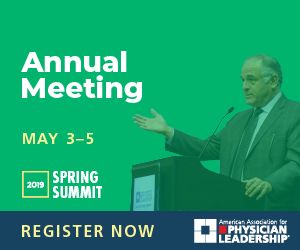 Let us know by emailing journal@physicianleaders.org.